The Java String valueOf Method is one of the Java String Method which is used to return the string representation of the user specified value. In this article we will show you the string representation of different data types using Java String.valueOf method with example. Before we get into the example, the basic syntax of the String.valueOf in Java Programming language is as shown below. The Java Programming Language provides nine different methods to return the String representation. The following Java string valueof method will accept the Boolean value as the parameter and returns the string representation of Boolean value. Following method accept the Character as the parameter and return the of char value in string representation. 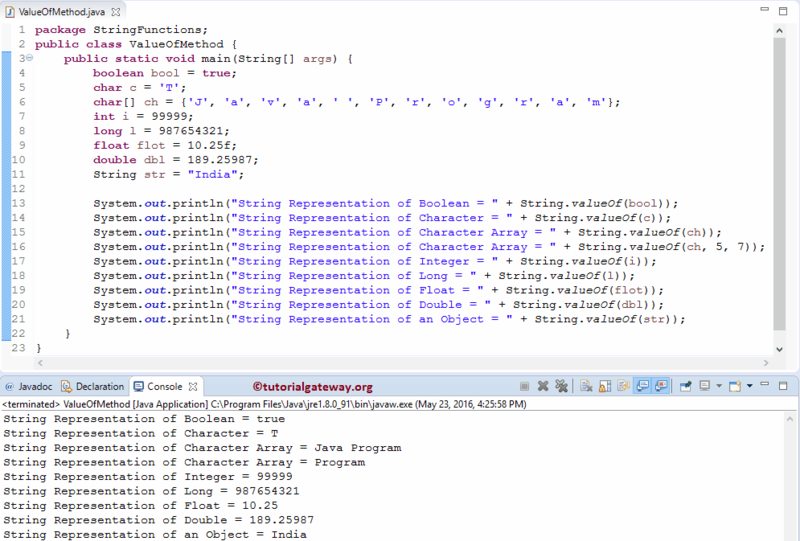 This Java String valueOf method will accept the Character Array as the parameter. Next, it returns the string representation of Char array. Following method will accept the Character Array as the first parameter, Starting index position (Starting_index) as the second argument and the array count as third argument. Java String.valueOf method will start representing from the Starting_index and return up to user specified count. Following Java String valueOf method will accept the Integer value as the parameter & return string representation of Integer value. This method will accept the Long value as the parameter and returns the string representation of Long value. This Java string valueof method will accept the Double value as the parameter and returns string representation of Double value. Following method will accept the Float value as the parameter and returns the string representation of Float value. Following Java String valueOf method will accept the Object value as the parameter and returns the string representation of an Object. The Java String.valueOf Method accepts different types of arguments and returns the String representation of the user specified argument value. The Java String.valueOf Method is used to return the string representation of the user specified value. In this Java program we will declare variables of different data types and return the string representation of those variables. Following System.out.println statement will call the public static String valueOf (boolean bool) method to return the string representation of Boolean value bool. Following System.out.println statement will call the public static String valueOf (char c) method. And return the string representation of Character c.
This Java string Valueof statement will call the public static String valueOf (char ch) method to return the string representation of Character array ch. The following statement calls the public static String valueOf (char ch, int Starting_Index, int count) method to return string representation of Character array ch. This will start looking for character at index position 5 (i.e., P) and count 7 characters (i.e., P, r, o, g, r, a, m), and then it will return the string representation of this sub array. Following Java string valueof statement will call the public static String valueOf (int i) method to return a string representation of integer value i. Following statement will call the public static String valueOf (long l) method to returns string representation of Long value l.
This statement will call the public static String valueOf (float fl) method to return the string value of Float value flot. Following Java String valueOf statement will call the public static String valueOf (double dbl) method to output string representation of Double value dbl. Following Java String valueOf statement call the public static String valueOf (Object obj) method to return String value str.